Jean-Pierre Raffarin, former French Prime Minister and China analyst, attended this year’s Boao Forum for Asia in south China’s Hainan Province. 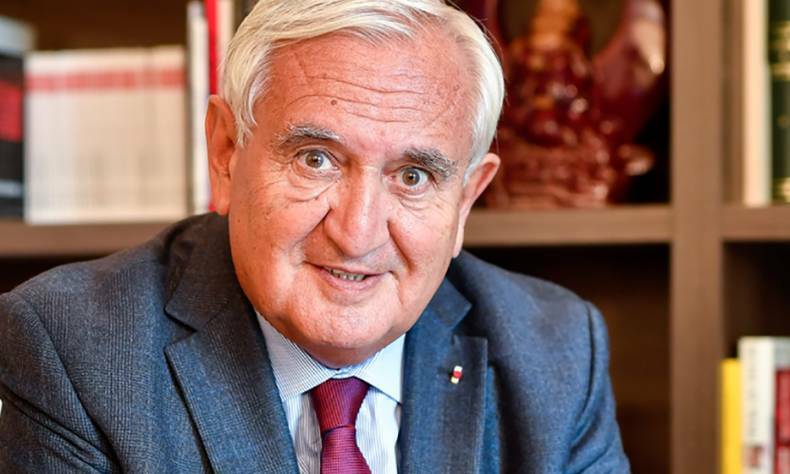 In an exclusive interview with Beijing Review President Li Yafang on April 8, Raffarin discussed current issues, including recent U.S. protectionist measures and his expectations for China’s Belt and Road Initiative. He also talked about China’s transformation, the importance of innovation and the potential for innovation and cooperation between China, Europe and the African continent. Beijing Review: The 2018 Boao Forum for Asia conference has opened under the theme An Open and Innovative Asia for a World of Greater Prosperity. As a regular participant, what do you expect from this year’s forum? Jean-Pierre Raffarin: This year, the international situation is tough; there are many conflicts. It is very important that we realize that only through international cooperation can we ease tensions around the world. And to do this, it is essential that Chinese President Xi Jinping use his leadership role to encourage a peaceful worldview. On March 23, U.S. President Donald Trump decided to impose tariffs on a number of Chinese imports. He took similar actions on April 4, prompting a reaction from China. What do you think of Trump’s decision and how should France, China and the European Union react? We believe that this unilateral decision is not the appropriate way to lead in the world. Global governance must be a dialogue in order to share ideas and find the correct balance. Unilateral decisions of this sort cannot promote a more balanced world. We believe that the right solution is multilateral dialogue. And that’s what French President Emmanuel Macron told President Xi on the phone. He said that we should react collectively to show that a multilateral outlook to solving problems is beneficial to world peace. In your opinion, what will be the impact of Trump’s decision on world trade? We believe that protectionism is always negative. Competition through protectionist measures and their escalation, sanctions and tariffs–all these measures aimed at protecting oneself–are in fact weakening global trade and the global economy. Just look at how China has resurged to the forefront of the world’s nations through reform and opening up. It is by opening to the outside world that China has been able to achieve strong growth and has made tremendous economic, scientific and social headway. And it is because Europe and China share a common desire to bolster and strengthen global exchanges that we want to pressure the U.S. decision so we can go back to a world where cooperation on an equal footing is the rule. As an old friend of China, you have witnessed four decades of transformation in the country. What has impressed you most? In which domains are you optimistic? What has been significant is the way Chinese cities have changed. I once visited Shenzhen when it was a village and today I see cities like Chengdu or Shenyang that have become very large and are now making an impact on the world. The pace of urbanization has been very impressive. There are also very beautiful cities, such as Hangzhou and Xi’an. I was amazed to see such huge development. What is even more striking today is China’s path toward innovation, seeing how China has realized that the country must find solutions for the future through innovation and new solutions. New problems have arisen, such as pollution and diseases, and as a result, considerable efforts toward innovation are needed. In his book, The Governance of China, President Xi called on young people to be innovators and to engage in research-oriented cooperative work. He urged them to innovate, travel abroad, seek ideas elsewhere, welcome foreign talent, and have a very open attitude toward the demand for innovation. In China, there is a true optimistic outlook for the future, as well as the will and the ability to find solutions to the problems we are facing today. This is why we must trust China’s youth, because they will find solutions to the problems that the previous generation was sometimes unable to tackle. What concrete actions could France implement to take part in the Belt and Road Initiative and in which areas? President Macron has taken a very clear stance in favor of the Belt and Road Initiative and we are already working toward identifying infrastructure, industrial and cultural mutual projects and establishing partnerships. We are doing this not only in France, but also at the European level. In July, the European Commission will publish a document and put forth its expectations regarding this initiative. We are already engaged in cooperation projects, and we want to invest in projects that are consistent with our interests–which are obviously very important to us–so that French companies can be involved, allowing our rules to be applied to a number of projects. Ultimately, we want to be able to discuss and work together. In Europe, we sometimes hear fearful voices, people who are afraid of China’s power. China has regained in the 21st century the power it used to enjoy in the 18th century, and therefore regained its place in the community of nations. In this regard, China is very impressive. But we say that we must not be afraid, we must work with China, cooperate with China, not only on Eurasia–Central Asia and Europe–but also on Eurafrica. We think there is much to be done in this respect, there are many projects to develop, and we must remain overtly confident. France is involved in many projects in Africa. The Belt and Road Initiative links China, France and Africa. What are potential areas of cooperation between China, France and Africa? Of course, there are many opportunities for cooperation in infrastructure and telecommunications. But there are also other areas that we can develop such as training and innovation. I think as we bolster young innovative talent in both Europe and China, we also need to talk to African youth and invite them to join the great competition for talent around the world. Young people in Africa make up a large, active group; we must invite them to participate in the great challenge of tomorrow, which is the invention of their future. What are the main roles that China as the world’s second largest economic entity can play in international trade? China can play two major roles today. The first is to propose large projects like President Xi’s Belt and Road Initiative; projects in which everyone can participate, that are not only good for China, good for Asia, but also good for other partners. First you need creativity to get these projects off the ground, because the world needs projects. We need to provide jobs and growth; this is why large nations have to carry forward these projects. This is a very important element. We also need to look at the role China can play, now that it has become a leading nation, as a balancing factor and I would even say a factor for peace. For me, the Belt and Road Initiative is a financial, economic and political project, but it is above all a project for peace. That is why today, in this world, China must be a force for balance and harmony. China does not have a history of war; it is not a war-mongering country. China defends its interests, which is legitimate; it also defends the interests of its people. It is important that China be a force for balance to preserve the world from escalating tensions and to prevent setbacks. We tend to forget that war is a tragedy, that damage caused by war is often irreversible. No development is possible without peace. What answers can China, France and the European Union bring to the current challenges? The first thing is to support multilateralism; support the UN and its Security Council; support UNESCO; and transform the World Trade Organization and international agreements. I think the world today needs the G20 and all those platforms where we can talk. Today, dialogue is the solution. Even if we disagree, even if we hold different views, we must agree to talk to each other, to find solutions; because basically, only dialogue provides solutions. Otherwise we open the door to potential considerable risks. I do not like it at all when Trump talks about “economic war.” The word “war” must always be rejected and it is necessary to systematically find ways to start a dialogue and come up with solutions.